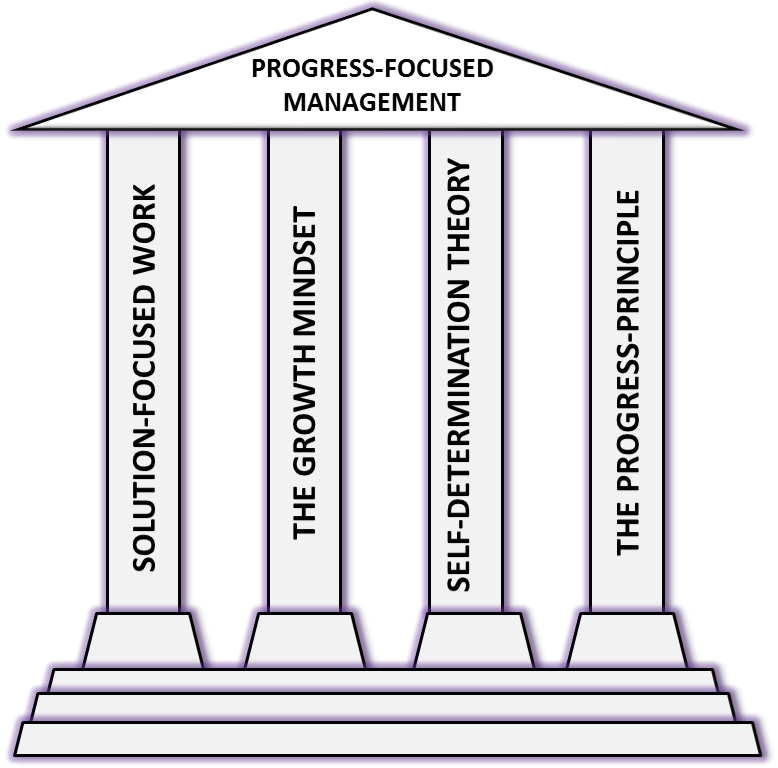 The solution-focused approach: progress-focused managers apply solution-focused principles and techniques both in helping employees and in directing and correcting employees when needed. They treat employees and colleagues constructively, also in challenging situations, and handle objections and resistance effectively. They take the perspective of the other person seriously and remain focused on achieving desired behaviors and results. Self-determination theory: both in conversations and in organizing, progress-focused managers focus on actively supporting people's basic needs for autonomy, competence and relatedness. Examples of this are: involving employees in setting goals and finding solutions and minimalizing the use of autonomy thwarting tools such as 1) coercion, 2) punishment, 3) incentives, 4) supervision, and 5) encouraging internal competition. The growth mindset: the work by Carol Dweck of Stanford University and her colleagues deals with the question to which extent people believe that people can change their capacities and traits. Research has shown that a growth mindset - believing in the malleability of capacities - is associated with many advantages for managers and for employees. A growth mindset not only influences the effectiveness of managers but also how they are seen by employees. 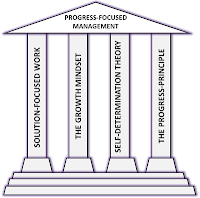 The progress principle: the work by Teresa Amabile of Harvard Business School and Steven Kramer has shown that achieving progress in meaningful work is the most important motivator of people at work. Progress-focused managers apply the insights of this research by helping people develop a clear idea about what meaningful work is, what progress looks like, what progress they are already making, how obstacles can be removed, and how practical help can be given. Is the progress principle connected to self-efficacy? I guess it is, in the sense that experiencing progress is likely to enhance self-efficacy. I'm not sure about any research into this.